We were out of town for over four weeks earlier this summer. 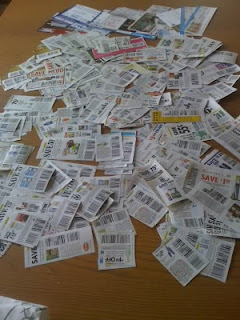 When I got home, I had a pile of coupons from the mail and circulars from the newspapers to get through. Here's what the pile looked like. The best coupon was for $10 on a $10 purchase at Kohl's. Unfortunately it arrived and expired while we were gone. Another good one was for a Free men or boys' haircut at Sportcuts. I also had a Free Starbucks postcard for 15 drinks purchased. It took me one naptime of watching a movie and clipping to cut all these out. It took another three or four sessions of sorting and filing to get everything squared away. I finished it up on August 30, about three weeks after we got home from our big trip. Couponing can be time consuming so I always trying to combine it with another activity like my relaxing at naptime or during family movie night. It pays off when I'm at the store though and I can find coupons quickly and efficiently, especially when it's those surprise clearance deals I'm not expecting.